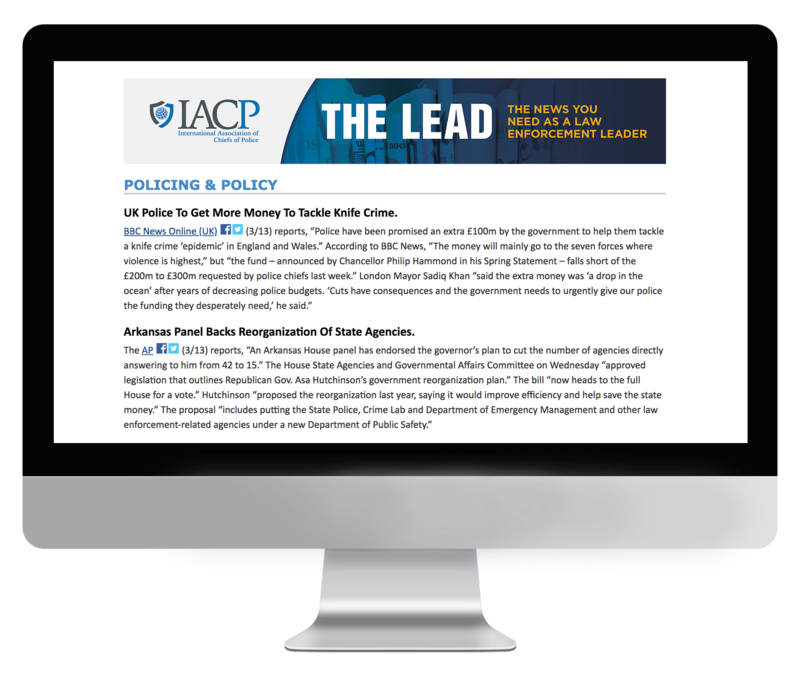 IACP'sThe Lead is an exclusive member benefit that ensures readers are informed on relevant issues affecting the police community. Sections in the briefing include: Policing and Policy, Community, Crime and Drugs, Technology, National Security and Law Enforcement at Work. Founded in 1893, IACP’s goals are to advance the science and art of police services; to develop and disseminate improved administrative, technical and operational practices and promote their use in police work; to foster police cooperation and the exchange of information and experience among police administrators throughout the world; to bring about recruitment and training in the police profession of qualified persons; and to encourage adherence of all police officers to high professional standards of performance and conduct. Subscription to The Lead is exclusively limited to IACP members. If you are a member of IACP and would like to receive this briefing, please reach out to the association directly.